Submit Tripawds Calendar Photos Now! Three legged dog and cat photos are now being accepted for the 2019 Tripawds Calendars! As usual, this is not a contest. There is no cost to include your photo, and there is no voting to get featured. However, a maximum of only three calendar designs will be produced, so read the photo requirements below and send yours in by deadline. First come, first served. Act now! DEADLINE PASSED: No more photos are being accepted for 2019 Calendars. NOTE: Production has begun and no further submissions can be accepted. Please stay tuned for the 2019 Calendar Announcement. Please read ALL details below before submitting your photo! Submit your favorite photo to see your three-legged heroes and angels in a 2019 Tripawds Calendar. Send your one great photo no later than Midnight Friday, October 12 and get featured in one of the 2019 Tripawds Heroes and Angels Calendars! 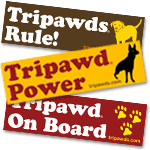 All registered Tripawds members and/or @tripawds followers and fans may submit one (1) photo of their three legged dog or cat. Photos of present-day Tripawds and/oror those at the Rainbow Bridge are welcome. Only photos showing three legged animals will be accepted. Got more than 1 Tripawd? No problem. Enter one photo per Tripawd, or send one group photo. Pictures of a Tripawd with a four legged pal are fine, as long as the Tripawd is prominently shown. 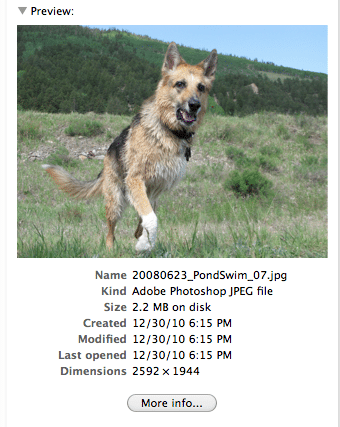 If your Tripawd has been in a previous calendar, send a new photo. Include the name of your Tripawd(s) and any other pets featured in the photo. IMPORTANT: Follow the photo file requirements below. If your photo file size is too small for a full-page image, it may still be in a calendar. But it will be small and grouped with other small photos. Photos submitted at resolution unsuitable for print production will not be included. *Only one photo per Tripawd will be accepted from each person. Photos emailed after Friday, October 12 will NOT be included in a calendar. The one image you submit must be of suitable resolution to be printed in a paper calendar. Small photos do not reproduce well in print. Want to make sure your Tripawd has a full calendar page all to him/herself? Your photo size must be at least 2400 x 1800 dimensions. A small photo like this looks terrible in print. Only photos sent by email will be accepted. You will receive a reply to your email or post confirming your image file is suitable for reproduction. Please be sure to include your Tripawd’s name when sending a photo! On a Mac computer, view the photo and “Get Info” by typing “ + i” (Command I). 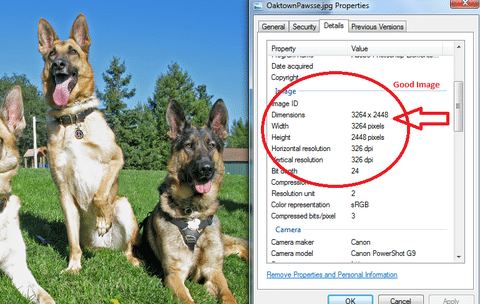 On a Windows machine, right-click to view image properties or hover your mouse over the photo in your Library or image viewer. Email more than one photo. We know that’s hard, but you can do it! Ask us to pick. It delays production, we will not choose for you. Request a specific month. Photos will be randomly placed throughout the year. Submit Photo by Email Here! Photos submitted by the 10/12/18 deadline will be included in one of the three 2019 Tripawds Community Calendars. Those received after the deadline will NOT. Thanks for understanding. 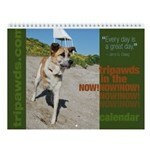 Calendars will be available for purchase in the Tripawds Gift Shop by November 1st. UPDATE: 2019 Tripawds Calendars Now Available! Miss the deadline this year? Create your own custom calendar here! Thank you making this year the best Tripawds Calendar ever! Proceeds from calendar sales help keep the Tripawds community online. The Annual Tripawds Quilt Auction is Almost Here! 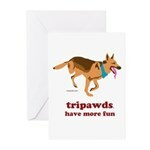 New Tripawds Gift Shop Sparkles with Three-Legged Pride! Thought we had until 10/18/18 to submit photos. When I checked the website on Friday the 12th that’s what it said so I selected my photo this weekend and now I see it shows the 12th as the deadline. Very upsetting! So now I can’t submit? Sorry you’re upset Janette. We noted the October 12 deadline when we originally published this announcement. Please respond ASAP to the email we just sent you.